The end of the Tokugawa period (1), where the film Yojimbo is set, and the beginning of the post-war economic recovery, the so-called Japanese economic miracle, when the film was made, represent two of the most important moments of drastic political, economical and social changes in the history of Japan. Akira Kurosawa's account of these changes in his film Yojimbo is quite negative as he seems to be portraying them as something destructive rather than constructive. To the critic Donald Richie, the main theme in Yojimbo is civil disorder and the social problem is the breakdown of a traditional society. This came about as a consequence of the rise of Western-style capitalism in Japan. Even though, the film is set in the 1860s, it also offers a view of the problems facing Japan during the post-war period. Richie sees the dreadful town in Yojimbo as contemporary Japan. In fact, Kurosawa appears to criticise the economical, political and social changes began by the Meiji government (2) and the situation in Japan during the 50s and 60s. The end of the Tokugawa regime saw the breakdown of a strict social class division o the shi-no-ko-sho social system, that is the four-class system of samurai, peasant, artisan and merchant. On the top of this social pyramid was the samurai, followed by the farmers and the artisans and at the very bottom the merchant class. As Joan Mellen has pointed out "the merchant as a figure has been a target of abuse and outrage, as if he and his class alone were responsible for the moral ruin in which Japan finds itself". The samurai class was forbidden from doing any kind of business or handling of money. The Tokugawa dynasty, which lasted for more than two hundred years, was a period marked by virtual peace. The samurai were no longer needed as warriors. Some took positions in the growing bureaucracy, others even started to deal in business but the majority descended into poverty. As opposed to the gradual decline of the samurai class was the rise of the long ridiculed and outcast merchant class who were, by the end of the Tokugawa period, sharing political power with the samurai class. In Yojimbo we see how the control of the town is already in the hands of two warring merchants: the silk merchant and the sake merchant. We hardly see them in the film but we are aware that they are the ones who pull the strings in the fight between the Seibei (Seizaburo Kawazu ) clan, who supports Tazaemon (Kamatari Fujiwara), the silk merchant, and the Ushitora (Kyti Sazanka) clan, who supports the sake merchant, Tokuemon (Takashi Shimura) for the total control of the silk market. David Desser has pointed out that the town in Yojimbo is based on a commodity exchange economy rather than a traditional agrarian system as the two gangs are fighting for the control of a market economy, not for the control of a town. For that reason, both gangs compete to get the services of a ronin (masterless samurai) called Sanjuro played by Toshiro Mifune. As Richie tells us "Sanjuro sees here the opportunity to make money". Both Joan Mellen and James Goodwin see the town's merchant dependence upon criminals or ronins to protect their business interest, as a parallel to the contemporary yakuza (Japanese gangsters) hired by big corporations to do their bidding by force. The samurai, a once proud and respectable class with a strict sense of honour and duty, is now in the hands of the merchant class, who used to be scorned by the samurai class, and to survive, they need to work for the merchants and accept their money. 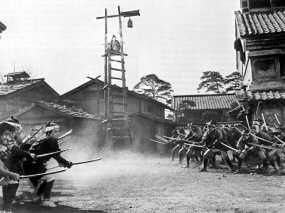 Even though, in Kurosawa's Seven Samurai the samurai that help the farmers are already ronins, as their position in society is in decline, they still behave like real samurai. They are men of honour, they follow the code of bushido and they help the weak. On the other hand, in Yojimbo, Sanjuro is far from the image of a typical samurai. Some critics have even suggested that he is greedy and evil. He is dirty, carries a toothpick in his mouth all the time, drinks heavily and, what is more important, accepts money from anyone. Gonji, the sake seller, says to him "a samurai, yet always harping about money". If in Seven Samurai we see the decline and the future disappearance of the samurai class, in Yojimbo, the samurai as we know them, are not longer there. To Stephen Prince the " rising business class threaten the logic of exiting social relations as the economy shifted to money, not rice, and to ties mediated by the exchange of commodities and the rationalization of profit, not personal allegiances and obligations". As money and not rice (the samurai, up to end the of the Togugawa period, were paid rice for their services and all business transactions were dealt with rice) was now the motor of the Japanese economy, another traditional social group that starts to experience a decline in Yojimbo, as opposed to the rise of the merchant class, is the farmers. In Seven Samurai, Shimura, the leader of the samurai, pronounces the defeat and disappearance of his class and the permanence and victory of the farmers as they are still useful to society. In Yojimbo, farmers are also disappearing as they are leaving the countryside lured by the money of the town. At the beginning of Yojimbo, Sanjuro meets a family of farmers just as the son is leaving his parents' farm to find fortune in the town. He prefers "a short exciting life rather than a long life eating rice-gruel", to what his father replies that "everyone is after easy money these days". At the end of the film, Sanjuro after killing the remaining criminals, spares the farmer's son and tells him that "a long life eating rice-gruel is the best". According to Richie, this is the message of the film: the situation of young people in Japan in the early 60s. The historian W.G Beasley describes how in the first phase of post-war industrial development, starting in 1955, a good deal of labour flowed from the countryside to the expanding cities. By 1960 cities contained 64 per cent of all Japanese. The farming community no longer played as important role in the economy as it had done before 1945. Agriculture's contribution to gross national product lost ground: 9 per cent in 1960, 5 per cent in 1970, 2.5 per cent in 1980. The farming population became a smaller proportion. They comprised 27 per cent in 1960, only 9 per cent twenty years later. As the farmer's son in Yojimbo is seduced by the luxury offer in the town so were Japanese farmers systematically abandoning the countryside to seek fortune in the swelling cities in post-war Japan. Another important element of the traditional Japanese society that starts to breakdown after the Second World War is the family which in Yojimbo is viewed as cold, malignant and repressive. Its dissolution is in close relation with money. A son leaves his parents' farm in search of what his father describes as "easy money". Yoichiro (Hiroshi Tachikawa), Seibe and Orin's Isuzu Yamada) son, is scolded by his parents, who provide the fighters for the silk merchant cause, telling him that he "can't get ahead in this world unless folks thinks you're both a cheat and a killer" and suggesting to him to kill Sanjuro "from behind". Later on in the film Yoichiro, after being kidnapped by the rival gang and returned in exchange for the sake dealer's concubine, kidnapped by his parents' gang, is slapped by his mother and scolded again for not having committed suicide and for causing so much trouble to his parents. The father of the family that Sanjuro saves and helps to escape the town, almost causing his downfall, is not much better. After gambling and losing against Ushitora, the sake dealer's henchman, he uses his wife as a payment for his debts as Tokuemon, the sake dealer, had taken an interest in her. So, Kurosawa may be suggesting that one of the causes of the disintegration of the Japanese family is money. Beasley describes some changes in the size and composition of the Japanese family that can be seen in Yojimbo. He says that typical of the "new Japan" was the urban family, which comprised only of two generations: a husband, a wife and the children, of whom there are not as many as there used to be. All the families portrayed in Yojimbo fit this model. In this aspect, Yojimbo could the predecessor of Nagisha Oshima's film Boy (Shonen, 1969) considered by Mellen as one of the bitterest satires ever to be made on the Japanese family. Based upon an actual event reported in the newspapers, the film follows a down-and-out family who makes their young son fake road accidents in order to blackmail motorists for "hospital fees". So greed for money is a pervasive theme in the film and also in close relation with political corruption and bribery. For instance, the first person Sanjuro meets in the town is the local police officer who for a small commission could sell Sanjuro's services as a bodyguard to one of the town's warring gangs. He is scolded by Gonji (Eijiro Tono), the sake seller, for not doing his job to prevent anymore fighting between the gangs and also for accepting bribes from them. The official inspector that arrives at the town just before another fight is about to start is also corrupt. He accepts bribes from both gangs as well as alcohol and women. Here again we can see another criticism of modern Japan. In the same way that in Yojimbo's town the political, economical and social life is dominated by two merchants, during the 1960s the Japanese economy was dominated by a small number of large scale manufactures (Mitsubishi, Mitsui, Fuji, etc.) known as zaibatsu. Japanese politicians still are under considerable pressure from these companies interests. Large secret donations had been made to politicians by companies seeking special advantages. Kurosawa also tells us how in the most terrible situation there is always somebody who benefits from it. The coffin-maker's business, for example, is booming out of the carnage going on in the town. This situation corresponds in a way to the period of economic recovery in post-war Japan. As a consequence of the Russo-American relations during the Cold War, Mao Tse-Tung victory in the Chinese civil war and the Korean war (1950-3), Japan, as an American base, began to take weight. In September 1951 Japan signed a defence agreement in which she promised to continue providing bases for American troops, aircraft and ships. The reward for these concessions was economic. The Korean war, in fact, gave an important stimulus to the Japanese industry by selling American war materials and related goods to the United Nations forces. Another source of criticism in Yojimbo is foreign influence as contributing to the loss of traditional values in Japan. This influence is symbolized in the figure of Unosuke (Tatsuya Nakadai ), Ushitora's youngest brother, who had just returned after being away for a year. He appears wearing a flashy, striped kimono and a strange, for the time the film is set, handkerchief around his neck, has a wild haircut and carries a gun: the symbol of Western power. Guns first arrived in Japan in 1543 brought by the Portuguese. Prince tells how the firearm brought to the town, along with the culture of the West, will end the warrior tradition. Common people were forbidden from using weapons and, after the 1630s, the Tokugawa government decided to close the country to Western power and remained so for more than two hundred years. Western influence and fire weapons were seen as a challenge to the samurai class hegemony. In 1853 with the arrival of American warships commanded by commodore Perry, who forced the Japanese government to open the country again, Japanese officials realized the only way to compete with the Western powers was to rebuild an army and economy system based on Western models. This helped to seal the death of the samurai class and start the decline of the farming class. Western influence on Japanese culture is ridiculed in the scene where Orin, Seibein's wife, calls some girls to entertain Sanjuro. The dancing, music and light used in this scene owes more to American style nightclubs culture than traditional Japanese dance and music. Kurosawa had already tackled this issue in previous films such as Ikuru, Drunken Angel and Stray Dog, where we notice the already powerful influence of American popular culture in Japan, as many scenes are seen in nightclubs where noisy American music is played and Japanese girls wearing American style clothes are working. So we see how Yojimbo is a good example for the studying of Japanese society during two periods of great social, political and economical changes and how these changes, in Kurosawa's view, contributed to the breakdown of a traditional society and the loss of traditional values. Family dynasty of shoguns (1603-1867) founded by Ieyasu Tokugawa that governed Japan for more than 250 years. Period(1862-1912) when Japan was ruled by the emperor Meiji, marked by the modernization and westernization of the country.